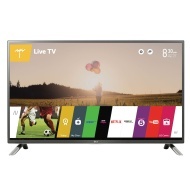 alaTest has collected and analyzed 120 reviews of LG 32LF650V. The average rating for this product is 4.5/5, compared to an average rating of 4.6/5 for other products in the same category for all reviews. Reviewers really like the design and price. The sound and usability also get good feedback. The energy efficiency and remote control get negative reviews. We analyzed user and expert ratings, product age and more factors. Compared to other products in the same category the LG 32LF650V is awarded an overall alaScore™ of 89/100 = Very good quality. All the extra apps if and when you need them - very smart. The splayed out feet for supporting the television - looks a bit unstable and only just fitted the television stand. Awesome range of features. Did not come with YouTube installed but was able to get it from the LG Content Store. Picture quality is amazing. It would have to be the lack of a printed user manual. There is an online help section but I like to fondle a manual rather than click a mouse.